It’s been a long old while since I’ve practiced meditation, or indeed any form of mindfulness; two of the many things I mentally flagellate myself about daily. This weekend, therefore, has been a blessing. Not because I’ve done either of those things (obvs), but because I have had the chance to spend some quality time with myself, and with nature. And because, as cheesy as it sounds, it has given me a much needed opportunity to reconnect with myself. Life rushes by at such an alarming rate – especially, as I’ve discovered in recent months, when you have a wedding to plan. Lately (or, to be truly honest, forever) I’ve felt so time poor it’s taken all my effort just to get home from work at the end of the day, run a bath and crack on an episode of Eastenders (weird new guilty pleasure – clearly a sign of stress) before falling, exhausted, into bed. Meditation? Ha. As if. I’ve never felt less calm or more busy. But then, last week, the soon-to-be-husband (eep!) announced he would be going back to the UK this weekend, sans moi (well, I had the choice to accompany him, but after last week’s boozy and nocturnal antics in Las Vegas the thought of spending 16 hours in a car only to hold a paint brush all weekend – they are renovating the family home, yes, I know, I’m a selfish cow – was too much to entertain). At first I was put out (see previous selfish cow comment), and sad at missing the opportunity to spend a quiet weekend together. I hastily scrambled some social options together in case I needed back up, and prepared to bunker down for a weekend alone with the bottle of Chianti hubby-to-be bought me to soften the blow (a welcome gift, and further proof, it it was needed, that he’s a keeper). Yesterday (Saturday), I lazed around in the morning then went shopping all afternoon. So far so good. In the evening, feeling more confident about being alone (Jesus, you wouldn’t think I’ve travelled alone for months at a time in the past would you? ), I declined all social plans, heated up a Marks and Spencer ready meal (God how I’ve missed those – totally forgot an M&S opened up here a few months ago. Result) and downloaded a gratuitous chick flick from Amazon. But it wasn’t until today that I felt a change occur. Yesterday was enjoyable, but in a shallow way (not that there is anything wrong with that, in my opinion, at least from time to time). I was gratified by material purchases and ‘guilty pleasure’ TV consumption, but that was as far as it went. Today I somehow knew as soon as I woke up it would be different. And it has been. My recent back injury having put paid to any hope of a pre-wedding gym comeback, I have to make sure I still get some exercise each day. I decided, therefore, to go for a walk, the timing of which was fortuitously impeccable. It had just rained heavily, and the sun was beginning to nudge the clouds aside. I walked to Tenbosch Park, just ten minutes from home. I don’t know what it is about that place, but as soon as I get there I always feel an overwhelming sense of calm descend upon me. It’s so beautifully kept, unusual in that it is both small and spread over several levels – sort of landscaped over a small hill – and feels to me like a secret garden, a tiny oasis amidst the sprawling metropolis. I just love it, and after visiting today by myself my mind feels clearer than it has done in weeks. I spent a while just standing and listening to the birds tweeting, watching as a parrot (yes, really, apparently Brussels is famous for them) flew overhead from tree top to tree top. It was wonderful, and a welcome reminder that even if I’m not meditating every chance I get, it’s still possible to find a little piece of peace in this frenetic world. This weekend I’ve spent a lot of quality time with family and good friends, something I realise I haven’t done nearly enough of in recent months. It’s so easy to get complacent about the people closest to you. They’re not going anywhere, after all. But it’s precisely because they’re not going anywhere – because they love you unconditionally, because they’ll never let you down – that you should make an effort to keep them at the centre of your life. They’re the people who understand you better than anyone else, the ones you feel most comfortable being your true self with. They’re the ones who can provide a listening ear and shoulder to cry on one minute and make you laugh like a drain the next. In short, you need them to be you – why wouldn’t you cherish them? I’ve also spent time this weekend reconnecting with friends – both in person and by email – who I made on my various travels over the past few years. I find these types of friendship so interesting, because you don’t share a history but you do create an unbreakable bond as you make new memories together. People who meet whilst travelling the world alone already have something in common – they’re searching for meaning in their lives, hoping for an adventure, maybe even trying to escape from a negative situation in the ‘real’ world that they’ve left behind. Whilst these kinds of friendships are very different to the friendships that have stood the test of time and turbulence, they are no less important. They teach you just as much about yourself – if not more – and should be valued and nurtured accordingly. Then there are the friends you don’t even know that well, or who you’ve long since fallen out of regular contact with, who contact you out of the blue to wish you well and offer words of support and encouragement at just the right time. Several such friends have done just that for me in the past week. Their kind words really picked me up when I was plagued with self-doubt about my writing, and they’ve given me the strength to carry on. Thinking about peoples’ tendency to be complacent towards their friends has, in turn, made me think about the simple act of saying thank you – not just when a stranger holds a door open for you or gives their seat up for you on the train, but to the people you know and love. To be a good friend, parent or sibling takes a degree of selflessness, you must be prepared to put your own ego aside and put that person before yourself. So when someone does that for us, shouldn’t it follow that we show our gratitude in some way? I can’t think of a better picture to go with this post than this, of me and my best friend at my mum and stepfather’s wedding. 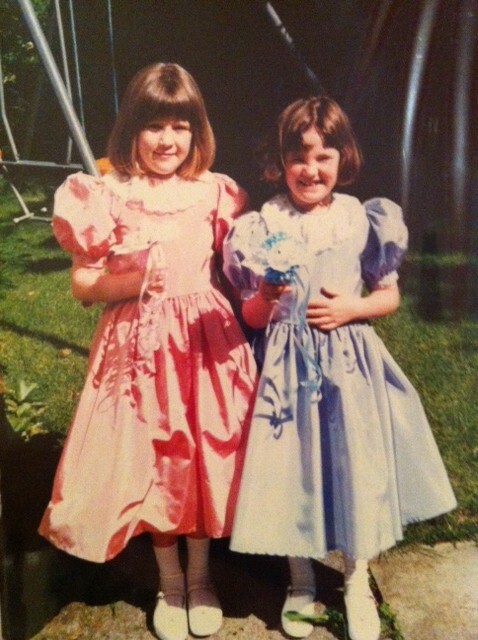 We were six years old and completely different (me a girly girl, my best friend a tomboy – hence the colour of our dresses!) but we were – and still are – inseparable. True friendship that stands the test of time doesn’t require you to be the same – it requires you to appreciate your differences, and be there for one another through thick and thin. I’m so fortunate to have wonderful friends who have done just that for me.